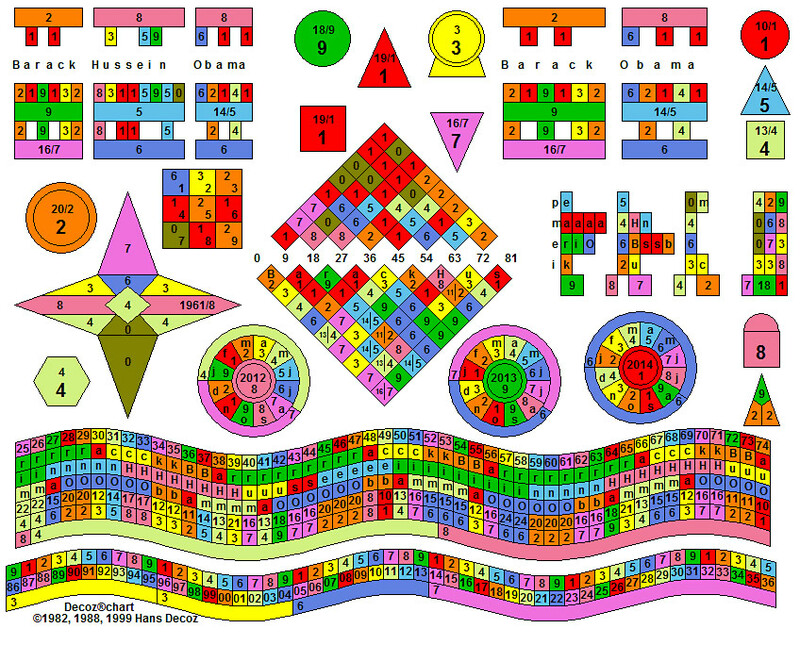 Let me try to be as objective as I can be when describing Barack Obama's Numerology chart. This is difficult, not so much due to the fact that he is my choice for president or because I like him as a human being, but because his is the quintessential politician's chart. Like him or not, the man was meant to be in politics. Three numbers are considered particularly favorable for politicians: the 1, the 2, and the 9. The 1 represents leadership, courage, drive, ambition and persistence, as well as a tendency to be stubborn and, at times, confrontational. The 2 is tact, diplomacy, and an uncanny ability to maintain or restore harmony and peace. On the downside, the 2 can be overly sensitive and given to mood swings. The 9 is all about global awareness, compassion, duty, and self-sacrifice, but the 9 can also be aloof and distant, if not a little arrogant. 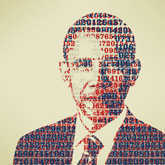 Barack Obama's core numbers are a 2 Life Path, a 9 Heart's Desire, and a 1 both as an Expression and a Personality number. And it doesn't end there. If I were to custom-design a leading politician's chart and then bring him to life, I might throw in a bonus in the form of a 4, just to add managerial skills and efficiency, discipline, a down-to-earth attitude, stability, and trustworthiness. And would you believe Obama has a 4 Birth Day? A finely tuned chart such as Obama's also has its challenges, of course. Any time you find both the 1 and the 2 among a person's core numbers, there's going to be strife and discord, which can only be overcome through effort and discipline, and it doesn't come easy. There is no doubt in my mind that Barack Obama, in his earlier years, especially during his teenage years and his twenties, often felt himself torn between his confrontational, impatient, goal-oriented, even aggressive 1 Expression, and the more sensitive, considerate, peace-loving, non-confrontational 2 Life Path. It is, however, the locations of the 1 and 2 that save the day and helped him find a useful, practical balance between these two opposing numbers. An often overlooked aspect of Numerology, even by many professionals, is the fact that the Life Path represents a cycle (from birth to death) and is therefore truly a "path." It's not a destiny, it's not a package of personality traits, and it doesn't define character so much as it defines a learning pattern. It's evolution at work. A 2 Life Path tells us that as the years go by, Barack becomes a little better at "being" a 2, since life itself -- it's circumstances and it's environment -- deliver the lessons and experiences necessary to fulfill one's Life Path. Obama becomes more intuitive, patient, diplomatic, and sensitive as he gets older, because those are the specific traits life is busy teaching him. The number 1 appears both as an Expression number and a Personality number. The Expression number is the clearest indicator of our vocational talents, and as such, the tendency to take charge, tackle problems head-on, try new methods, push ideas through no matter how much resistance, dominate debates, and be as unstoppable as required, are all generously represented in the nature of Barack Obama. His 2 Life Path may make him choose a diplomatic approach, but behind that is the steely determination of the 1. He is, as they say, not the kind of guy you want to mess with. Fortunately, his 1 Personality makes that clear to anyone who meets him, because those traits are right there on the surface, he doesn't hide them. 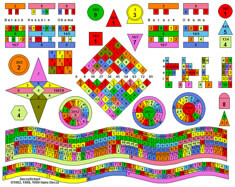 In a Numerology chart, as in real estate, location is everything. The fact that you have a 7 or a 1 or a 5 means absolutely nothing. What matters is WHERE you have a 7 or a 1 or a 5. The aforementioned 9 core number in Barack's chart is found as a Heart's Desire, and its effect is exactly that: it tells us what most prominently satisfies the desires of his heart. In Obama's case, he is basically a typical "do-gooder." Yes, whether you agree with his ideas or not, this man is motivated first and foremost by a desire to improve the quality of life for mankind. The 9 is the Mother Theresa number, and no politician should be without a 9 Heart's Desire, as there simply can't be a more legitimate motivation to be in politics than a need to have a positive impact on the world and its inhabitants. Mind you, that doesn't mean the ideas of what would improve our lives are always good, but at least the motivation behind them is genuine. Other numbers in Obama's chart worth mentioning are his 3 Maturity number, his 7 Balance number, and his 1 Hidden Passion. His 3 Maturity number is beneficial for two main reasons: already a great communicator, he just becomes better and better as he gets older. But perhaps more important for Obama himself: the older he gets, the easier it becomes for him to "lighten up," to let go of the burdens of responsibility now and then, to simply enjoy being around friends and family. It becomes easier to just be happy and optimistic when you have a 3 Maturity number. Barack's 7 Balance number gives us some insight in how he deals with important issues: he turns inward, where he analyzes and contemplates and weighs the pros and cons in search of answers. Obama needs a quiet place, especially during particularly turbulent times, because it's in deliberation, more than in debate or the advice and opinions of others, that Obama finds the confidence to make decisions. 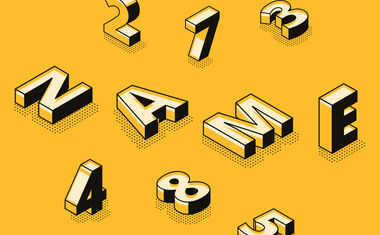 His 7 Balance number is, however, based on a 16, which tells us that he is no stranger to self-doubt or fear of failure. Fortunately, with six 1s in his name -- giving him a 1 Hidden Passion -- that's pretty well balanced by the inborn faith and self-confidence typical to a 1 Hidden Passion. The occasional moments of self-doubt and insecurity brought on by the 16 therefore generally don't have any lasting negative influence. It's just enough to help him remember that he may be a big man in the arena of American politics and the global community we call mankind, but in the eyes of the Creator he is like any other human being, and as such can be no larger than his or her consciousness allows. I know, that's all pretty good, right? All that positive stuff about Obama. And you're thinking I'm pushing an agenda here, trying to sell you an idealized version of Obama. Perhaps I am, because as far as I am concerned, objectivity is for robots and androids. The reality is though, that this is his chart and it's a good one. I trust that when you are ready to vote, you will base your choice on whether or not Obama's ideas and convictions are better than the other guy's. As far as his ability to be the president HE wants to be, you don't have to doubt the strength of his convictions or the integrity of his idealism; they are what they are. Next up: Willard Mitt Romney. (Willard, what a name! There was a woman named Willard Emma Hart, dead now a good many years, who was an early proponent of higher education for women. Ironic, non?) But I took a peek and Mitt has an interesting chart. The two candidates only have one core number in common. There again though, location is everything. Following that, in a third blog, I plan to look at the cycles of both men and talk about the future., what's in store for them, as human beings, and perhaps how that affects the rest of us.